Ch. 3 - The Virtue of Trust - My Catholic Life! Do you trust God? One of the most beautiful prayers you can pray comes from the Divine Mercy devotion: Jesus, I trust in You. So do you? And if you do, what effect does this have on your life? How do you trust? How deep is your trust? How did you arrive at the level of trust that you have? These are but a few essential questions that have to be addressed if you are to allow your embrace of the virtue of humility to lead you to the second most important virtue on the path to holiness: trust. If you trust God in the deepest way, then you have faith in Him in an active way. Having an active faith in God means more than believing in Him. Surprisingly, even the demons believe in God (see James 2:19). An active faith means that you believe fully surrender your life to Him. You entrust your whole being to God and to His providential care and guidance. So how is trust in God experienced, practically speaking? Let’s presume that you have chosen to embrace the virtue of humility. As a result, you have begun to shed the fear and anxiety that comes from worrying about what others think of you and you have come to see yourself as God sees you, taking your dignity and value in this truth alone. You have begun to be freed from the desire for superficial flattery and you have begun to fully desire the good of others, even more than your own good. You are becoming selfless in your thoughts, actions and even desires. 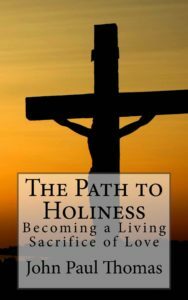 This is good and provides the basis for walking down the path to holiness. However, these humble dispositions are only the foundation for what is to come next on one’s spiritual journey. Humility prepares you to make the radical choice to put your complete trust in God and God alone. As humility grows, so also trust in God must grow. So how do you take this additional step of putting all your trust in God? How does a humble soul, who has turned away from selfishness, now turn to God in an act of surrender? Entrusting yourself to God first requires that you embrace the fundamental truth that you can do nothing good without God. Period. Understanding this fact is essential to the virtue of trust. God, and God alone, is the source of all goodness in life. Without Him, you are left to your sins and to a life of misery. It is sometimes hard to believe that you are powerless to do anything good without the grace of God. However, the truth is that no gift, talent or quality you have is sufficient to make it on your own and to produce good fruit in your life. You are powerless by your own effort to walk down the path of holiness. Do you believe this? Believing this truth requires the most basic form of faith: a passive faith. However, believing this truth is not enough. Faith must also be actively lived. Let’s begin by understanding these two levels of faith so that we can then learn how to obtain them both. Though this may seem more like a theological lesson than a practical one, understanding faith is essential to living it. Faith can be described as both passive active. First, a “passive faith” is sufficient to arrive at the belief that God is the one and only source of all goodness in your life. Having a passive faith means that you know and believe this fact and you do not doubt it. This is a good truth to discover and it is an essential first step toward greater trust. Sadly, it’s a truth that many fail to comprehend. So begin with this step and ponder this truth in your own life. Once you believe that God is the only source of all goodness in your life, you must then enter into an “active faith” in God. Having an “active” faith means that you allow your belief, present in your intellect, to move also into your will and ultimately your desires. In other words, you must allow what you have come to believe to change you. You must make a free choice to let God take over your life and produce good fruit in it. The result of believing in God and entrusting yourself to Him is the glorious transformation of your soul. God enters into your soul more deeply and takes control, guiding you day after day in accord with His holy will. Living such a life of radical trust produces good fruit in your life and prepares you to both receive and distribute God’s mercy. A third point also needs to be made to understand how an act of trust transforms you. Believing and entrusting yourself to God is not something you can do on your own. God must be the one who takes control and transforms you. It is only by an action of God that you can actually trust Him. You must do your part, but God is the one who takes control of your life and enables you to be transformed into a soul that is guided by His grace. To offer further clarification, let’s look at an analogy. Say you have a seed in your hand. You know that this seed has potential to grow into a beautiful flower if planted and cared for. However, the seed cannot achieve its potential unless it is actually planted. Additionally, planting alone is not sufficient. It must also grow and bloom before it achieves its potential and beauty. You can plant the seed, nourish it and care for it, but you cannot make it grow. The growing is something that God does by His providence that He has instilled into the nature of the seed itself. So it is with faith. We must believe that God alone is the source of all goodness in our lives, but unless we actively surrender to Him, day after day, moment after moment, allowing Him to take control of our lives, then our faith is like a dead seed waiting to be planted. Total surrender is like placing the seed in the ground and allowing God to take over, bringing that seed of faith to fruition. If you do your part, God will do His and will bring His grace into full bloom in your life. Therefore, having the seed in your hand is analogous to believing in God, the planting and watering is analogous to entrusting yourself to God, but the growing and blooming is something that God alone can do. However, God is always faithful and will transform the “seed” if you do your part. Trust begins when God speaks to you, you discern His voice, and you begin to respond. Thus, God is the first one to act by offering you an invitation. Your response must be 100% a free choice you make. However, it must also be 100% a choice God makes by way of an invitation and grace. Trust cannot be arrived at without a perfectly cooperative effort between you and God. For example, consider a person who encounters the hardship of a year of struggle after a serious car accident. During those long hospital stays, this person will be tempted with despair, anger, doubt and the like. However, at the same time, if he is open to the grace of God, he will hear a gentle invitation from God calling him to trust Him more deeply. It is in these moments that the person must make a choice. Will I entrust myself to the grace of God and accept His invitation? Will I respond to Him and answer the call He is putting on my heart? Or will I turn in on myself in self-pity and resentment? An active faith becomes a response to God in moments like this and transforms hardships into glorious blessings. Therefore, when you experience hardships in your life, open your ears to listen to the gentle voice of God, let Him speak to you, call you to surrender, and invite you to let your struggle be transformed by His grace. The fact that you make the choice to surrender to God in the midst of this trial adds much power and merit to your choice. In this situation, the interior anguish and suffering actually have the effect of elevating the choice to trust in God to profound heights. The suffering one faces is transformed into a grace. Therefore, it’s important to understand that trials in life offer us incredible opportunities for holiness. When you make the choice to surrender more deeply to God because of some suffering you are enduring, there is great value in that choice because you are invited to radically overcome self-pity, selfishness and pain. Reflect, also, upon the person whose life is going quite well. This person will also be invited by God, every day, to turn and surrender to Him more deeply. However, it’s important to note that the gentle invitation from God, in these moments, will be far more subtle and will require an even greater attentiveness to His voice. Why? Because the only motivation for trust in God in these moments will be pure faith. The person whose life is going quite well will not be pressured by any outside influence to hear the invitation. Rather, that person will be invited to surrender simply for the sake of surrender. This invitation may even involve letting go of some of the “good things” that are encountered in life. However, letting go of these more superficial “good things” will be done to choose that which is even better: a life of more profound faith and charity. There is also great merit in this form of surrender to God. It is different than surrendering to God because of a trial experienced in life, but it brings much grace, nonetheless, particularly because the choice is made in great freedom without any immediate motivating factor other than love of God. For example, imagine that you have a wonderful marriage and a beautiful family. Your job is producing a large income and you continue to advance in your career. You are living the “American dream” and all is well. However, deep down you realize that there is more to life than this form of success. You realize that God wants more for you and for your entire family. You begin to hear God’s gentle voice calling you to a more radical life of surrender. As a result, you make the choice to respond and begin surrendering more deeply to the will of God simply out of love for God. You firmly resolve to give God everything and are ready and willing to let go of anything God may ask of you. This is a risky choice in a worldly sort of way. What may God ask of you? The real question to ponder is not so much God may ask of you; rather, the question is whether you are ready and willing to give to God even before you know what He may ask of you. The key is trust. Do you trust God enough to let Him take the lead? And if, at first, His gentle invitation does not make sense, are you willing to embrace His will and say “Yes” every day? For the person who surrenders all, especially when life is good, the future will become even more blessed in a far better way than could ever be imagined. Perhaps not in a worldly way, but certainly in a far better way since it will produce the good fruit stemming from a life filled with an abundance of grace. Let’s look at an analogy. Say your daughter needs surgery and you buy her a gift and give it to her as a consolation. This occasion of her hospital stay offers you an opportunity to show your love by giving a gift. However, what if you decide to give a gift to your daughter for no specific reason other than to freely express your love on some other day of the year without any immediate motivating factor? Which act of gift-giving will most likely affect her more? And which act of gift-giving is a greater expression of love on your part? Both are good, and both occasions bring untold blessings in their own unique ways. However, the freely chosen and unexpected act of love has great value simply because there is no motivating factor other than love. So it is with surrender to God. When the only motivating factor for surrender and trust is love of God, this act is of great value. The important point to take from this section is that no matter if your life is filled with suffering, is going quite well, or is somewhere in between, the potential for you to surrender more fully to God is great. No matter where you find yourself, there is great value in responding to the invitation from God to entrust your life to Him and to embrace His most holy will. One important factor in trusting God is knowing His will. Unless you know what God is asking of you it is difficult to say “Yes” to His gentle invitation. But what is the will of God for you? How do you know what He wants of you? What are you to say “Yes” to in your life? These are important questions to answer if you are going to live an active life of faith and surrender. Jesus says in Matthew’s Gospel, “By their fruits you will know them” (Matthew 7:16a). So it is with the will of God in your personal life. A great way to discern the will of God is to look at the good fruit that comes forth when you embrace one decision or another. This is a very helpful principle of discernment to remember. What good fruit should we look for? St. Paul’s Letter to the Galatians offers the following good fruits that come with the embrace of the will of God in your life: love, joy, peace, patience, kindness, generosity, faithfulness, gentleness, and self-control (see Galatians 5:22-23). If you experience the above good fruit, you should use this as an indication that what you are doing is in accord with the will of God. If you do not see these good fruits in your life, or perceive other unholy effects resulting from choices you make, then you should proceed with caution and conclude that your actions are not in accord with the will of God. But beware! Sometimes you can misconstrue good spiritual fruit with other forms of fleeting satisfaction. As an extreme example, some people may find revenge somewhat fulfilling. They may take delight in this or that action that gets back at someone who has hurt them. They may even see it as a matter of God’s justice, concluding in a self-righteous way that they are in the right and the vengeance is deserved. Though there may be some form of twisted delight and satisfaction that comes through something like revenge, once you come to know the authentic Fruits of the Spirit, you will not mistake them for false representations and distorted pleasures. St. Paul lists the following contrasting works as indications that we are not embracing the will of God: immorality, impurity, licentiousness, idolatry, sorcery, hatreds, rivalry, jealousy, outbursts of fury, acts of selfishness, dissensions, factions, occasions of envy, drinking bouts, orgies, and the like (see Galatians 5:19-21). If these are present in your life, then you can be certain that you are not making choices in union with the will of God. Another important principle in discerning the will of God is to look again at the virtue of humility and to look at the way that humility affects your desires. Ideally, if your desires are imbued with humility, you should be able to quickly and easily follow the will of God simply by following your desires. However, your desires are only a good source of discernment of God’s will when you are humble. When you are humble, meaning you are free from selfishness and fear and authentically desire the good of others, then you can more easily trust that whatever desire is in your heart is also in union with the will of God. On the contrary, when you still struggle with pride and selfishness, your desires are usually a poor guide. The most important source of discernment and surrender comes from prayer. It is impossible to discern the will of God and to surrender to Him without an active life of daily prayer. An active life of prayer is not the same as saying prayers. Clearly it is good to say prayers, to intercede for your needs and those of others, to join in formal prayers, liturgical prayers and the like. However, having a “life of prayer” implies something much deeper. A life of prayer means that you have formed a habit of communicating with God over time in such away that it becomes ongoing, sustaining and foundational to every decision you make in life. It means that daily meditation, faithful surrender, a healthy moral life, and a basic embrace of holy living has so affected you that you are living an active and real relationship with our Triune God throughout the day, every day. A life of prayer means that you have come to know the voice of God and are familiar with His promptings. This cannot be learned overnight. It cannot come simply by asking God to speak. Rather, it is something that comes slowly, as a result of an ongoing relationship of love with God. By analogy, consider two teenagers who “fall in love.” At first, the teenagers may not be familiar with each other enough to understand the various moods, words or attitudes of the other. There may be constant struggles with clear communication, and emotions may cloud the relationship. Compare them to a couple who has been married for over 60 years and has lived a very loving marriage with strong communication. Often times, very little needs to be said for them to understand each other. In fact, in some ways, the spouses may know the other even better than they know themselves. This form of knowledge takes time, commitment and love. As the years go by, the relationship deepens and develops. The same is true with God and discernment of His will. At first, a new Christian may not clearly understand what God says and why He says it. However, as the years go by and the person continues to pray deeply every day, this life of prayer, based in mutual love, will enable the soul to begin to understand God and His ways more easily. God, for His part, understands us perfectly already. However, we are the ones who need a life of prayer to understand God and His will more fully. Therefore, in a life of trusting surrender, there is no substitute for daily prayer with God, lived day after day, year after year, decade after decade. Your life of prayer provides the context by which you meet God and encounter His holy will more directly than in any other way. However, your life of prayer is not only for discerning the will of God. Prayer must also become the foundation for every choice and every action in life. Once God and His will are encountered in prayer, you must then allow the rest of your daily living to be transformed by these encounters. Prayer alone must become the source of all you choose in life because prayer will be your lifeline to the will of God. Hearing Him speak, responding to His will, and allowing Him to transform your life will be the fruit of an authentic life of prayer. Prayer changes you, because in prayer, God takes over your life. This forms trust and surrender. The problem that most people encounter is that they say a few prayers here and there. They go to church each Sunday. They try to live a morally upright life. But they fail to daily encounter the living God in prayer. Saying a few prayers here and there, going to Sunday Mass and living a morally upright life are great. However, they are not enough. Every person needs time alone, every day, to do nothing other than to pray. This is often a difficult habit to form. It’s so very easy to allow the activities of the day to steal away the most important part of your day. It’s easy to go through the day, week, month and even through life without actually connecting to God in a deep and all-consuming way. However, it must be done if you are to become holy. By analogy, spouses who spend time every day in conversation, sharing, listening and understanding, slowly build the foundation for a mutually supportive relationship. This is especially true when what is shared is done so in a prayerful spirit. When the conversation is harsh, rude and critical, the marital union begins to weaken. However, when the daily conversations are ones filled with honesty, respect, charity, mercy and understanding, then their hearts grow closer. When a couple spends many years together, sharing this depth of conversation on a daily basis, the intimacy and love they share is powerful and sustaining. The same is true in our relationship with God. When we form a daily habit of communicating, listening and understanding the mind and heart of God, our bond with Him becomes sustaining and transforming to such a degree that our life of prayer becomes the foundation of our lives. Embracing a life of prayer is not something that priests and religious alone are called to do. Everyone must pray and everyone must become familiar with the gentle and inviting voice of God echoing within the depths of their soul through prayer. This is not an option if you want to become holy. And if you understood the value of holiness, you would desire this form of daily prayer with all your might. If your daily prayer life is not one through which you encounter the voice of God, then this is a good time to do something about that. Start by setting aside some time each day when you can be alone and have no other distractions. Even if you begin with only five minutes a day, this is good. Everyone can find five minutes a day for something as important as prayer. Prayer is ultimately a conversation that must become ongoing. The time you give exclusively to prayer each day must permeate every other part of your day. It first requires a willingness on your part to be honest with God so that God can bring order to your life. He knows every detail of your life, but by bringing the details of your life to Him in prayer, you open your heart to know what He has to say about those details and you allow Him to enter in and take control of those details. This takes time and commitment. Therefore, the first step is to make the simple choice to begin communicating every day with Him. Let’s look at one general approach you can take to begin a life of prayer. ur mind the most that day. Perhaps there is a joy you are encountering, or something you are very anxious about, or both a joy and a burden. Whatever is on your mind, begin with that. From there, turn your heart to the Heart of God and simply place your burden and/or joy before Him. Do not seek an answer or demand any response, just give Him that which occupies your mind and heart. Too often when we pray, we want immediate answers. We become impatient. However, God does not usually work this way. He often remains silent so that we will more deeply surrender everything over to Him. As you daily place yourself and your struggle or joy before Him, do not expect an immediate answer. Trust Him. Entrust yourself to Him and leave it at that. Be attentive and wait for God to speak a gentle invitation to surrender to Him. If God does speak, you are blessed. If you only hear silence, then know that this is what is best for you in that moment. Allow yourself to grow in patience and continue to place your life in His hands, waiting for His gentle promptings. If you do this every day, you will come to realize that God does communicate back to you in ways that are beyond words. Your “answer” will come in a way that only God can speak. Most importantly, you will have begun to surrender yourself to God by daily placing before Him that which most affects you. After spending some time quietly, placing your daily struggle and/or joy before God, there are many other forms of prayer that you can pray. Offering a rosary, praying a chaplet, meditating on a short passage in the Gospel, or praying other formal or traditional prayers are all very helpful. Come up with an effective routine. If you are not sure what is best for you, try various forms of prayers until you feel drawn to one of them. But remember, saying prayers is not the same as praying. When you say prayers or meditate on the Gospel, make sure that it is coming from your heart and is an authentic communication with God. You don’t have to go through many prayers, you only need to pray. In fact, one prayer truly prayed is far better than many prayers only spoken. Another important factor in prayer is silence. Don’t be afraid of silence. If, for example, you are praying a prayer and something in that prayer strikes you, stop for a moment, savor it, ponder it, and listen to God in the silence. Listening to Him does not necessarily mean you are hearing an answer. Prayerful “listening” is simply a way of being attentive to God as He makes His presence known. Prayer is not thinking, it’s being in the presence of God. Yes, we listen to God speak when He chooses to communicate some idea, but when God is silent, this means that He wants to communicate on a much deeper level. Words are not sufficient at times. In those moments, God simply wants you to be in His presence and know His love. So look for gentle invitations in your daily prayer time to stop and be silent in His presence. This form of prayer will do more for your relationship with God than you could ever know. If you can build a daily habit of this form of prayer, spending even a short period every day with Him, you will begin to experience Him taking control of your life. You will begin to trust Him easily because He will be the one enabling you to do so. Your trust will happen as a result of being in His presence. By opening up your soul to Him and by communicating with Him on a deep level, you will find that you do trust Him and that through your moments of prayer you are surrendering to Him as He enables you to do so. This will especially happen in moments of silent prayer. The communication that He “speaks” to you will be one in which He enters into your mind and your will and then slowly takes possession of them. You will begin to believe more firmly and love Him more completely. This is trust. This is surrender. From here, let’s turn to the Scriptures for some insight into trust. The following passages should be read slowly and meditatively. Return to them and let God speak to you through them. the Lord will be their trust. These Scripture passages tell us many things about trust in God. First, persons who trust in God are truly wise. They are wise because they have discovered that God, and God alone, is the source of all goodness in life. These passages also reveal that God has a perfect plan for your life and that He will never let you down. You should not be afraid of following Him, because the result of complete trust is far better than anything you could come up with on your own. Lastly, these passages reveal that there is great freedom in trusting God. When God is in control of your life, the heavy burdens of anxiety and worry disappear. The humble and trusting soul is not tossed and turned by the turmoil of life. Rather, the humble trusting soul is always at peace no matter what comes its way in life.